Push-ups are a form of calisthenics exercise. It involves the raising and lowering of the body by the use of the arms and palms pressed against the ground. 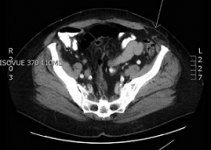 To perform this exercise, the individual has to maintain a prone position. This activity includes the exercise of the triceps, pectoral muscles and anterior deltoids along with added benefits for the other deltoids. It is used for military physical training, civilian athletic training and martial arts. Sometimes, it also serves as a form of punishment as well. Knuckle push-ups – This variation involves resting the knuckles on the ground instead of the palm. It is used for training in martial arts, tae kwon do, karate and boxing. The exercise is done to strengthen the knuckles whereby the wrist and forearm are kept in the punching position and it lowers the strain on the wrist as compared to the traditional push-ups. People practicing this variation use a padded floor or place a towel on the floor. However, people who train for boxing wear boxing gloves and those who practice martial arts do knuckle push-ups with bare knuckles. Maltese push-ups – In this variation, the position of the hands is closer to the hips and there is more distance between the two hands. It is also thought of as a gymnastic variation of push-ups. Hindu push-ups – Such a name is chosen for the variation due to its extensive practice in India and Pakistan as a part of their physical cultures like Indian martial arts and pehelwani. The push-ups start with a downward dog yoga position and then transitions into a cobra pose position. 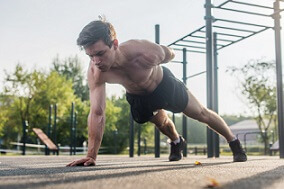 Single leg push-ups – The variation involves doing a set of push-ups with one leg off the ground and then switching the other leg to do the next set. One arm push-ups – In this variation, only one arm is used to do the push-ups while the individual holds the other behind his/her back. It increases the resistance on the trainee. Narrow grip push-ups – This kind of push-up is done by keeping the hands a few inches apart from under the chest. Spiderman push-ups – Doing normal push-ups by raising knee toward the elbow while lifting the body. 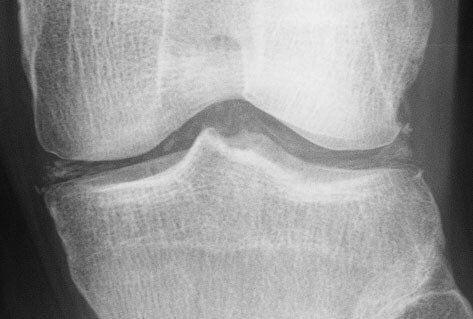 The individual can switch knees during the process. Clap push-ups – This involves pushing one’s self off the ground and quickly clapping in mid-air at the peak of the push-up. It helps to develop explosive power and bulk up the pectoral muscles. 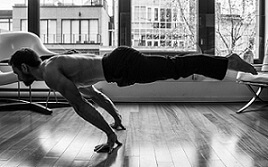 Planche push-ups – This is an extremely difficult variation in which only the hands are used to do the push-ups without resting the feet on the floor. The hands are kept under the body’s center of gravity. It requires great strength and balance. Backhanded push-ups – This type of push-ups are done by using the back of the hands rather than the palms to perform the exercise. Strengthens Muscles – Major muscles of the upper body like the muscles of the chest and triceps are exercised while doing push-ups which make them stronger. It also helps in building muscle mass by increasing the production of human growth hormone. Prevents pain – The muscles and of the shoulder are moved to increase their strength. Push-ups make it more flexible and prevent pain in the neck and the shoulder. Push-ups are also suitable for those who do a lot of carrying and lifting work as they help to prevent injuries and back pain. It also gives support to the spine and strengthens the abs, obliques and lower back muscles. Healthier bones – Push-up is a resistance exercise that uses body weight and makes bones strong and healthy. 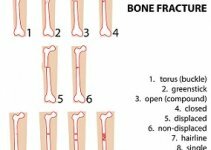 It prevents loss of bone density and limits chances of osteoporosis. Helps in weight loss – This form of activity is a form of resistance exercise that helps to build muscles. Thus it burns calories faster and aids in weight loss by increasing the metabolic rate. Agility – Sports and other daily activities become less exhausting for people who do push-ups. Exercise that focuses on a particular area of the body makes the area more flexible. Since push-ups involve several body parts and muscles it makes the body more agile on the whole. Posture – Keeping the back straight is the correct posture at all times. Regular exercise in the correct manner helps to prevent different body aches and corrects the individual’s posture. Testosterone levels – The level of testosterone increases when a large number of muscle fibers are worked. Push-ups involve the working of large muscles such as triceps, chest and shoulder that leads to high testosterone levels. Prevents an increase in testosterone levels: Hence it can prevent diseases – Osteoporosis, high blood pressure and diabetes. High testosterone levels also limit the formation of visceral fats in the body. 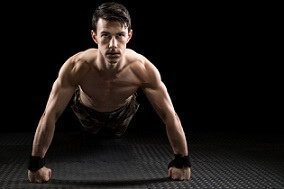 Cardiovascular health – Push-ups promote a healthy heart. It aids in proper blood circulation within the body that keeps the heart in a good working condition. Prevents injuries – Sometimes people suffer from injuries when they try to exercise. However, push-ups are a much safer kind of exercise as it does not put too much strain on a particular area and the pressure is equally divided through-out the upper body, hence making it stronger. Difficulty – People may experience difficulty while trying push-ups in the initial stages. For doing the exercise comfortably, the knees can be used for support instead of the toes. Injuries – People who do push-ups are prone to wrist injuries. Care must be taken to avoid such instances. Use of dumbbells rather than placing one’s palms on the floor while performing this exercise could prevent such accidents from taking place. Shoulder pain – People who already have a shoulder injury may face pain in their shoulders while doing push-ups. A doctor must be consulted to make sure that the injury does not worsen. Images Copyright: 123RF.com: maridav, undrey, dolgachov, Nicholas Piccillo, Aleksandr Davydov, seoterra, Jasminko Ibrakovic, Michael Heim.